If you broke Elena’s heart, Star Wars would spill out. So when she decides to queue outside her local cinema to see the new movie, she’s expecting a celebration with crowds of people who love Han, Luke and Leia just as much as she does. What she’s not expecting is to be last in a line of only three people; to have to pee into a collectible Star Wars soda cup behind a dumpster or to meet that unlikely someone who just might truly understand the way she feels. Thus, despite Kindred Spirits only being a short story, I felt the urge to review it. Frankly, I was very much in the correct mood for this story. I felt myself being imperceptibly tugged into the grips of a reading slump, and Kindred Spirits managed to throw me miles away from one like an ejector seat. This novel was light-hearted but meaningful, sweet yet hilarious, and I loved it. Obviously, though, I could have done with more. I could have read a whole book based on this concept. However, I knew what I was going into, and so I was content with the entirety of the story, feeling as though I was abandoned with just the right amount of questions, just the right amount of theories that make a novel good. My English teacher stresses that subtlety is key to engaging writing. You shouldn’t tell the reader that this happened, then this, then this, then this. You should imply things, or just hint at them, so as to ensure the reader stays on his/her toes throughout, and is eager to discover the fate of the characters. Rowell has a similar technique, and I love it. I love the fluid and seamless transitions between time and location, and I love the characters she builds. The few characters mentioned were easily recognisable, and went through beautiful developments in just a few days. It’s wonderful how Rowell has worked with such a sort time-frame – as well as a short word count – to develop such a meaningful and complete novel. Personally, I believe the development of a character over just a few days is a fantastic entity to peruse. So, if you enjoyed any other novel by Rainbow Rowell, or you are a simultaneous consumer of both Star Wars, and YA fiction, I encourage you to pick up this short story – you won’t regret it! 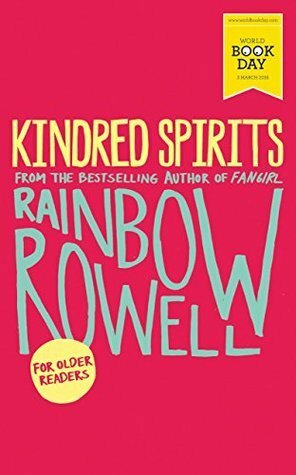 Kindred Spirits is a short story, and Rainbow Rowell is a well-known author, and so I am entering this novel for the number 51 spot on the Around the Year in 52 Books challenge: A short story from a well-known author. Yay!